This article discusses the power of reading aloud and goes a step further to discuss the power of thinking out loud while reading to children as a way to highlight the strategies used by thoughtful readers. Once upon a time, there was a grownup, a child, and a very good book. Goodnight Moon by Margaret Wise Brown is a beloved children's bedtime story. Young children instantly relate to the struggle of the little bunny trying to get to sleep. Such stories are memorable because they move children and allow them to make personal connections that inspire them to think more deeply, to feel more wholeheartedly, and to become more curious listeners. Many of us can remember from our own experience the precious time spent sharing and talking about stories. We remember relating to the friendship between a little girl and a teddy bear named Corduroy in the book of the same name by Don Freeman. We also related to the friendship between a spider and her pig friend, Wilbur, in E.B. White's Charlotte's Web. We connected to the characters, their situations, or the settings in which the stories took place. Little did we know that when we were making such connections we were learning to think and act like good readers. Because reading aloud provides children with a model of confident and expert reading, many parents and teachers make it a vital part of their teaching practice. This article praises the power of reading aloud and goes a step further to praise the power of thinking out loud while reading to children. It's an easy way to highlight the strategies used by thoughtful readers. Katherine Paterson, author of Bridge to Terabithia, once told a seventh-grader, "A book is a cooperative venture. The writer can write a story down, but the book will never be complete until a reader, of whatever age, takes that book and brings to it his own story." Developing into this kind of reader requires children to become conscious of the multiple comprehension strategies that allow them to deeply understand and engage with the material. The first three sections of this article present current research and practices related to reading aloud. The last section shows how to apply this research to your work with children. We will discuss the important benefits of reading aloud; how to choose good books to read aloud; how to model or teach comprehension strategies as you read aloud; and examples of how to use these comprehension strategies with two sets of books. Reading aloud is the foundation for literacy development. It is the single most important activity for reading success (Bredekamp, Copple, & Neuman, 2000). It provides children with a demonstration of phrased, fluent reading (Fountas & Pinnell, 1996). It reveals the rewards of reading, and develops the listener's interest in books and desire to be a reader (Mooney, 1990). Listening to others read develops key understanding and skills, such as an appreciation for how a story is written and familiarity with book conventions, such as "once upon a time" and "happily ever after" (Bredekamp et al., 2000). Reading aloud demonstrates the relationship between the printed word and meaning – children understand that print tells a story or conveys information – and invites the listener into a conversation with the author. Children can listen on a higher language level than they can read, so reading aloud makes complex ideas more accessible and exposes children to vocabulary and language patterns that are not part of everyday speech. This, in turn, helps them understand the structure of books when they read independently (Fountas & Pinnell, 1996). It exposes less able readers to the same rich and engaging books that fluent readers read on their own, and entices them to become better readers. Students of any age benefit from hearing an experienced reading of a wonderful book. Children need to be exposed to a wide range of stories and books. They need to see themselves as well as other people, cultures, communities, and issues in the books we read to them. They need to see how characters in books handle the same fears, interests, and concerns that they experience (Barton & Booth, 1990). Selecting a wide range of culturally diverse books will help all children find and make connections to their own life experiences, other books they have read, and universal concepts. (Dyson & Genishi, 1994). Children use real life to help them understand books, and books help children understand real life. Choose books that invite children to respond with enthusiasm and understanding. Look for books with rich language, meaningful plots, compelling characters, and engaging illustrations (Gambrell & Almasi, 1996). Is the book worthy of a reader's and listener's time? Does the story sound good to the ear when read aloud? Will it appeal to your audience? Will children find the book relevant to their lives and culture? Will the book spark conversation? Will the book motivate deeper topical understanding? Does the book inspire children to find or listen to another book on the same topic? By the same author? Written in the same genre? Will children want to hear the story again? By modeling how fluent readers think about the text and problem solve as they read, we make the invisible act of reading visible. Modeling encourages children to develop the "habits of mind" proficient readers employ. Helping children discover these connections requires planning and modeling. Parents and teachers can encourage and support thinking, listening, and discussion, and model "think-alouds," which reveal the inner conversation readers have with the text as they read (Harvey & Goudvis, 2000). Parents and teachers can point out connections between prior experiences and the story, similarities between books, and any relationship between the books and a larger concept. To make connections between the book and your own life, think aloud as you share. When you read the beginning of A River Dream by Allen Say, for example, you can comment, "This book reminds me of the time my father took me fishing. Have you ever been fishing?" To make connections between related books with the same author or similar settings, characters, and concepts, say "Mufaro's Beautiful Daughters by John Steptoe is an African tale that is similar to the tale of Cinderella. Both stories are about sisters – one kind and the other spiteful. Do you know any stories about nice and mean sisters or brothers? Let's continue reading to find out other ways the stories are similar." To connect a book to a larger world or universal concept, you could say to your student, "Stellaluna by Janell Cannon helps me understand that we are all the same in many ways, but it's our differences that make us special." While fluent readers make these types of connections with ease, many readers do not. Children need to be shown this type of thinking and then asked to join in and participate in book conversations. This active involvement gives you, the teacher, a glimpse into each reader's thinking. We found that many children's books are based on classic or universal concepts that come up again and again: understanding ourselves, exploring relationships with families and friends, and investigating other communities, people, and ideas. These concepts help children better understand the social fabric that makes up our world. One way to begin training parents in how to use "think alouds" is to bring a selection of books with a universal theme, like friendship or family traditions, and have parents read them aloud to one another. Prompt parents to think about the comprehension strategies they are using and to make the same connections they want children to make. The following are two collections of books that lend themselves especially well to "think alouds." This sample set of books communicates the idea that we can be anything we want. As children develop their sense of self, they often doubt their own abilities. These stories allow children to share such doubts and they model how children can reach their goals. Concept: We can be anything we want to be. Amazing Grace opens the conversation. Begin by asking an open-ended question to help the listener make a connection between the book and his or her own life experience. For example, "Grace loves to pretend to be characters from stories. When you pretend, who do you like to be?" The story then reveals that Grace wants to play Peter in her class's production of Peter Pan, but the other kids tell her she cannot – Peter's neither African American nor a girl. Model thinking out loud with a connection such as, "This reminds me of the time I was told I couldn't play soccer because I couldn't run fast enough." This helps draw the listener into the connection. Ask the listener to share his own experiences, and to predict what Grace might do next. Like many children, Grace turns to her family. Nana, Grace's grandmother, takes her to see an African American ballerina performing Juliet from Romeo and Juliet. While this reference may be lost on some children, they will relate to the line from the story, "I can be anything I want?" Children will be eager to predict the ending of the story – at the tryouts for the play, the class agrees that Grace is best – and will relate to the last line of the book, "If Grace put her mind to it, she can do anything she wants." In The Wednesday Surprise, Anna and Grandma work every Wednesday night on a surprise for Dad's birthday. At the beginning of the story, ask your student to talk about hir or her experiences of attending surprise parties, being watched by a babysitter, having a grandparent who lives nearby, or simply reading books with someone – including with you. As the story continues, model book-to-book connections. For example, "This story is about the relationship between a grandmother and her granddaughter. There were also a grandmother and granddaughter in Amazing Grace. Do you think these two stories will be alike? Let's keep reading to find out." Encourage your student to think about what reading every Wednesday night might have to do with the surprise. The story reveals that Anna is teaching her grandmother how to read. Although Dad thinks he has received all his presents, Grandma gives him the best one of all – she reads aloud the stories that Anna has taught her. Draw out the book-to-book connection: "When I read that Anna's grandmother wanted to be a reader, I think that the story is about how we can be anything we want to be. This reminds me of the story, Amazing Grace. Grace also believed she could be anything she wanted to be. Also, like that story, this one shows the relationship between a grandmother and a grandchild." Then follow i[ with an open-ended question to your student, "How is Anna's relationship with her grandmother different than Grace's?" City Green is the last book in this set. Like the others, it is well written and supports the universal concept of self-determination. When a young girl and her elderly friend create a community garden, an empty lot in an urban neighborhood is transformed into a wonderful place filled with flowers and vegetables. While many children may not have had experiences with community gardens, they may connect to the city scene and the idea of wanting the place you live to be beautiful. By this time, your student might be eager to share her thoughts on book-to-book connections. All three stories depict a grandparent figure and a young girl. All three show how the two work together to get something done. In both Amazing Grace and City Green, the characters did not believe in something, but had a change of heart. Connections between books and universal concepts are made during the reading of each story, and deepen after the last story. You might model how all three stories support the idea that we can be anything we want. "Grace wanted to be Peter Pan. Anna's grandmother wanted to be a reader. What did Marcy want to be in City Green? What would you like to be? Who will help you become what you want to be?" This collection allows children to share their own stories of being new to a situation and to gain an awareness of the experiences of other newcomers. In addition, these stories allow you to discuss ideas about diversity and acceptance with your student. Concept: Being a newcomer is filled with challenges and memories. Painted Words/Spoken Memories is the anchor book for this theme. It is a picture book that shows two aspects of the immigrant experience, both from a child's perspective. The first story, "Painted Words," follows Marianthe or Mari, who is new to the United States, and her mother on the dreaded first day of school. Some children have personal stories of being new to this country; others have stories of being new to a classroom, school, or neighborhood. These experiences will help relate what you read to the theme. Your conversations with your student may include topics such as moving to a new home, making new friends, or learning a new language. In the "Spoken Memories" section of the book, Mari shares her life story through art. Encourage your student to share parts of his life story by modeling how to do so. "My mother used to tell me stories about what it was like to leave her home in Jamaica. Has your family always lived in this area or did they move here from some place else?" Try to be sensitive if the child is not comfortable sharing. Your student will see herself as a storyteller and immediately relate to this aspect of the book. Like "Painted Words", Going Home is about a family leaving one country to live in another. Ask your student to make this connection between the two books. This book also presents the idea that parents may call one place home, and their children, another. When Carlos and his family go to his parents' village for Christmas, he realizes the sacrifices his parents have made so their children may have better lives. Pause to listen to your student's thoughts about work, family values, and so on. Reread the lines from "Spoken Memories": "People were leaving our poor village. They were going to a new land, hoping for a better life." This line will emphasize the connection between the two books. Compared to the first two, the remaining books in this collection may be more abstract (for some children). The Memory Coat begins at the turn of the century in the characters' native country and ends in the United States. The character, Grisha, who has lost his parents, will not give up the tattered coat his mother made him before her death. Unless your student has a personal experience with immigration, it will be the coat that he or she relates to. Your student will likely make a connection between a sentimental or favorite item he or she could not part with and the character's need to hang onto the coat. My Freedom Trip is the last companion book in this collection. Unlike the other books, the characters in this book do not immigrate to the United States. They flee North Korea for a better life in South Korea. Your student may want to compare and contrast this story with the others for a richer understanding. Explore the idea that many people leave their countries or communities for a better life, and a better life does not necessarily have to take place in the United States. You can also ask, "What are the things that make life better?" Through this rich discussion, you can help your student make connections between the books and the main concept of the collection – being a newcomer is filled with challenges and memories. 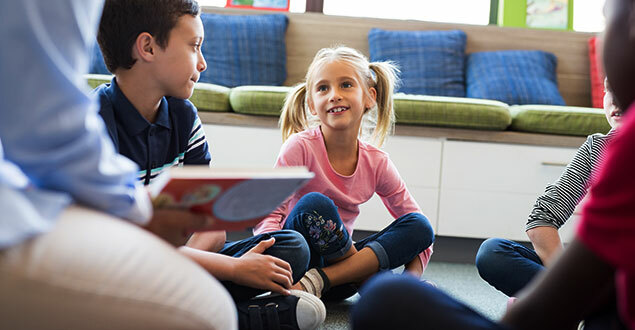 Developing comprehension strategies through reading aloud requires planning and setting up an environment of thinking, listening, and discussion. You will soon learn how to follow your student's lead: modeling connections, asking questions, encouraging discussion, and using literature to prompt personal storytelling. Become comfortable with slight diversions. Through conversations and diversions, children make meaning and share connections that are relevant to them. Reading aloud to children gives them the opportunity to try on the language and experience of others. It helps them make connections with their lives, and informs their view of themselves and others. Thinking aloud helps children learn how to use comprehension strategies that are important when reading independently. Reading comprehension instruction has been recommended as a practice with solid research evidence of effectiveness for individuals with learning disabilities by the Council for Exceptional Children — the Division for Learning Disabilities (DLD) and the Division for Research (DR). To learn more, please read A Focus on Reading Comprehension Strategy Instruction. Barton, B., & Booth, D. (1990). Stories in the classroom: Storytelling, reading aloud, and roleplaying with children. Portsmouth, NH: Heinemann. Betz, A. (1998). Scholastic treasury of quotations for children. New York, NY: Scholastic Reference. Block, C.C. (1997). Teaching the language arts: Expanding thinking through student-centered instruction (2nd ed.). Boston, MA: Allyn & Bacon. Neumann, S.B., Copple, C., & Bredekamp, S. (2000). Learning to read and write: Developmentally appropriate practices for young children. Washington, DC: National Association for the Education of Young Children. Cullinan, B.E. (2000). Read to me: Raising kids who love to read (Rev. ed.). New York, NY: Scholastic. Fountas, I.C., & Pinnell, G.S. (1996). Guided reading: Good first teaching for all children. Portsmouth, NH: Heinemann. Gambrell, L.B., & Almasi, J.F. (Eds.). (1996). Lively discussions! Fostering engaged reading. Newark, DE: International Reading Association. Greene, M. (1994). "Multiculturalism, community, and the arts." In A.H. Dyson & C. Genishi (Eds. ), The need for story: Cultural diversity in classroom and community (pp. 11-27). Urbana, IL: National Council of Teachers of English. Harvey, S., & Goudvis, A. (2000). Strategies that work: Teaching comprehension to enhance understanding. York, ME: Stenhouse. Hearne, B. (with Stevenson, D.). (1999). Choosing books for children: A commonsense guide (3rd ed.). Chicago, IL: University of Illinois Press. Keene, E.O., & Zimmermann, S. (1997). Mosaic of thought: Teaching comprehension in a reader's workshop. Portsmouth, NH: Heinemann. Kostelnik, M.J., Soderman, A.K., & Whiren, A.P. (1999). Developmentally appropriate curriculum: Best practices in early childhood education. Upper Saddle River, NJ: Merrill. Moir, H. (Ed.). (1992). Collected perspectives: Choosing and using books for the classroom (2nd ed.). Boston. MA: Christopher-Gordon. Mooney, M.M. (1990). Reading to, with, and by children. Katonah, NY: Richard C. Owen. Rosenblatt, L.M. (1968). Literature as exploration (3rd ed.). New York, NY: Noble & Noble. Snow, C.E., Burns, M.S., & Griffin, P. (Eds.). (1998). Preventing reading difficulties in young children. Washington, DC: National Academy Press. Trelease, J. (1995). The read-aloud handbook (4th ed). New York, NY: Penguin. Reprinted with permission and adapted from The Tutor, a publication of Education Northwest (2001). For any reprint requests, please contact the author or publisher listed. Great article. I do lots of think alouds with my students. It's great to see their responses when you do this, it's like a light bulb going off! Really appreciate the suggestion of books!! Awesome ideas and resources to use in the classroom. I cant wait to use it and see the change in my kiddos. This was a very interesting article. I actually believe we should do more read alouds in the classroom, even at the high school level. Common Core is all about making our students critical thinkers. Since, most students' listening comprehension skills are higher than their reading comprehension skills, with Read-Alouds our students can delve deeper into complex text. Some very good information was provided in this article. I enjoyed reading it and learned alot. I'm trying to help my 7 year old daughter with reading comprehension. Thanks for the article and the recommended books. WOW.. this is great. my son is having some problem in his reading so this should help me help him more with his reading. thank you so much for doing this research. thank you so much for doing this research and book searching. my daughter has a hard time and I'm looking for ways to help her understand what she reads.